I'm right there with you, one conversation at a time. Explaining it all, and feeling sad at the same time. I think I'm sad because to Noah, she's just Addison. Period. And then the rest of the world intrudes on our Normal, and I have some splainin to do. He accepts her. She's the only sister he's ever had. He just doesn't know any different. But the rest of the world puts labels on her and feels sorry for her and sometimes stares at her. So it hurts to put it into words because I don't want him to see her differently. I want him to love her as she is, without all of the rest of the baggage. we found the book "views from our shoes" to be very helpful. Discussing family issues in general with kids is just so different, so much more weighted than it is when talking to adults. I can blab to any grown-up that my parents divorced when I was 12, I don't feel like it bothers me. But when I finally had to explain to Gracie that Pap, in Pennsylvania, used to be married to Neenup, who lives in DC, I could barely get the story out. You hate to complicate their little world, to reveal to them that the family has had hard things happen in the past, things that we're still dealing with in one way or another, every day of our lives. It's a relief that they only want the basic outline, right?! Our situation is much different, but I can relate. Our daughter was stillborn a few weeks before her due date, just before our Max's 3rd birthday. Telling him what had happened was one of the hardest parts of the whole ordeal. The best advice we got came from a hospital social worker, who told us to always be honest with him but to refrain from giving too much information all at once. To let him come to us with questions. Although it was tempting to sit down with him and tell him the whole story, we decided to follow the advice and simply tell him what happened. Over the last year and a half, he has continued to ask questions about his sister and death in general, and I think our honest answers to his questions as they come have helped him understand on his own terms. Although I feel like I have accepted her death and can talk about it pretty freely with other adults, I still get that big knot in my stomach and lump in my throat whenever he brings it up. I think it is just our natural instincts as mothers to protect our children and provide them with a idyllic childhood. It seems so unfair that they have to deal with such a complicated and difficult issue - one that many adults never even have to face - at such a young age. Sounds like you are doing a great job telling the story of your family to your daughter, even though it is tough at times. Kid are pretty perceptive. We started having these conversations when my daughter was only three because she was starting to ask questions. We told her that her brother has down syndrome and that things are harder for him. we try to discuss it with her if she has questions that come up. whats hard is that she has surpassed him on many levels and will sometimes say- "I am the oldest, right" and then we need to remind her that her brother is older even if he cant do all the things she can. She often talks about how he cant talk well or doesnt use the potty or goes to a different school, because he has down syndrome and it seems to make sense to her. we talk abt all the great things he can do. they are great friends and playmates bec they are 15 months apart. What really broke my heart though was when she told me a few months ago that she is tired of taking care of her brother, that it is too hard for her. She feels such a tremendous amount of responsibility for him, which is sweet but it also makes me sad. so we have been reassuring her that its not her job to worry about her brother, that we will take care of him..sibling stuff is not easy. when she is older, i will definitely sign her up for a sibling support group! sorry for the long ramble but its something i think abt a lot. For me, it has not gotten easier to talk to our daughter about her brother with time. As she gets older, the questions have changed. She wants to understand more, and with that understanding comes the weight of things we were trying to protect her from. But, it's still so important...and I think, it's important for her to sometimes see us cry with the explanation too, which happens more and more as we talk about the seriousness of his disease. There are some wonderful perspectives here--Kendra's and Ruchi's stand out from my POV, but they're all great. I thought I would write you and just say that I do presentations at schools and talk to children about cerebral palsy (which I have too). I tell them that my muscles are like a telephone. And sometimes, I might want my brain to call my hand but it might call my foot instead. It's hard but you can do it. Sabrina seems very interested which is really good. Good luck! Your brain is like a telephone. CP means that when I call my thumb I might really call my foot or leg instead. When you call your thumb to come out it just does it but my call might get missed, not answered or redirected. My muscles are the same as yours but they stay tightened up, like when you tense up when you're really mad that's why my hands look different than your hands. My five year old is slowly figuring out more and more how different his brother is from "regular" kids. Its hard to know how much information to give him at this age. Kendra and "finding normal" echo our feelings about those difficult questions. We answer honestly and only give them the info they want. One conversation at a time. Our older girls have asked about Ashley and his future and his condition but little Cerys just knows him as he is. It can be so hard for the siblings. So much attention goes to our oldest (Asperger's) and I know the others (7 and 3) sometimes resent it. They don't understand why their big brother reacts to them the way that he sometimes does. The 3 year old recently asked if his brother hated him. How can a 3 year old begin to understand when I'm not always certain that I understand? Your post today really struck a chord with me as we just had a somewhat uncomfortable discussion in the car on the way to school this morning. Our youngest two boys are six-year-old twins; one, Jude, with Down syndrome. The older twin by a minute, Simon, asked this morning why he and Jude don't ride the bus. Uh...because I knew Jude wasn't ready for the regular bus (hitting, running, etc. ), and sure didn't want to put both boys on the special needs bus nor did I want 2 buses to come by the house since we live waaaay out in the sticks. Simon desperately wants to ride the bus like his friend Kline. I told Simon that Jude isn't ready for the bus. When he asked why, I reminded him about how Jude doesn't stay in his seat and about how he tends to hit other children when he's excited. "Jude may be ready for the bus someday, but he's not now. Remember how Jude learns things more slowly?" I asked. You're right. These discussions are hard. When the twins were born, I spent as much time worrying about Simon as I did Jude just for this reason: I imagined these future questions from Simon and embarrassment and possibly resentment. 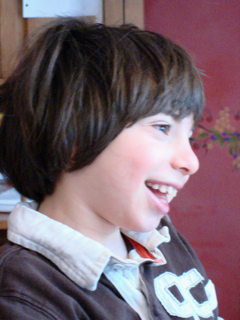 I wanted him to love his brother unconditionally and dreaded the day when they'd go to school and his view of Jude might be tainted by seeing him through the eyes of his classmates. Next year, I think I may just let the 2 buses come by. Why not? If the school is willing to do it, and they are. It might be good for both of them. God knows I'm just making all of this up as I go along. I got tears in my eyes reading this. I can imagine it would be difficult to talk about but it's so great she's slowly asking questions. And it made me sad too that there aren't other kiddos at her school with CP. I'm a big believer in inclusion, but I know so many schools are not set up for it as they need to be. I hope this changes. Hi, Beth. "Making this up as I go along" is exactly it for me, too. I think you handled that well. Kendra, I'm sorry for what happened; refraining from giving too much info at once is good advice. I let Sabrina steer our conversations. Janine, I love that telephone analogy, and I will be using it with Sabrina. I am so glad to have you here, your perspective is very welcome. Debbie, I'm sorry I made you cry first thing in the morning. I will share something tomorrow that will make you smile, promise! i was 5 when my sister was born. when she was a few months old, i was helping my mom give her a bath. i remember stopping, turning to my mom and asking "does she have what corky has?" my mom laughed and said "yes" but in a way that she couldn't believe i didn't know that already. mom explained about the extra chromosome, i asked if my sister could just get all her blood taken out and new blood put in...that was a big fat "no", (although i would like to think my problem solving skills at the time were impressive). i'm sure i had a million and ten questions that my mom dreaded having to answer, but i honestly don't remember any other conversations. maybe because nothing was ever "well it's like this because she has down syndrome". it was always "this is what she needs and this is how we do it", there were no other options or chances for "what if"s.
i definitely pulled the "you love her more" card in elementary school. not because my sister had down syndrome or because i even really felt that way, but because my mom spent a lot of time and energy fighting for her to be fully included and i liked the perks that came along with her guilt. our lives didn't really revolve around "down syndrome" growing up. somehow i just understood it and it was something that my sister happened to have. no biggie. i don't think kids have the chance to imagine their families and their picture perfect lives. so when life happens and things don't turn out the way others had hoped, it really isn't noticed. i don't know...i figured you had a lot of mom perspectives...one from a sibling couldn't hurt. my sister is totally awesome, is my best friend, and since she turned 21 in july, my new bar hopping buddy.